On the heels of THE INSIDER, I was definitely in a Pacino kind of mood. 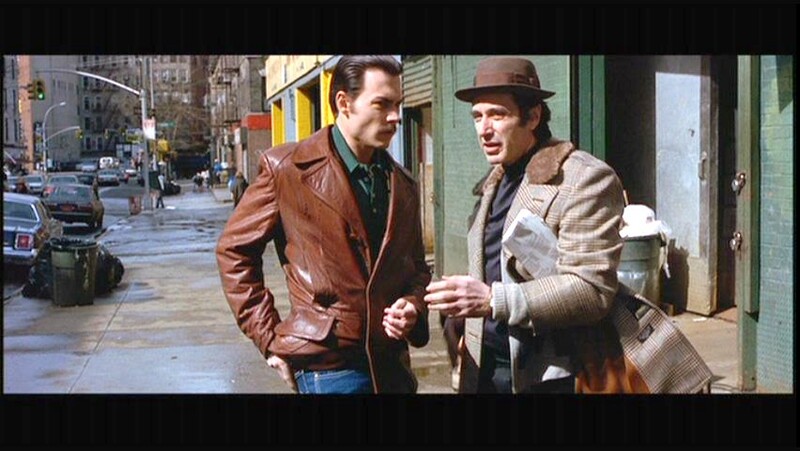 DONNIE BRASCO has been floating across HDNET for the past month or two, and it is a film I’ve been meaning to see. Mafia flicks are certainly not my go to genre. To be sure, there are some greats (GODFATHER, UNTOUCHABLES, etc), but I also find this facade of machismo to be borderline silly in many cases. But DONNIE BRASCO is a well liked film with a great leading duo of Al Pacino and Johnny Depp. So it is a movie I certainly was eager to get to. I watched DONNIE BRASCO (1997) on 11.13.12. It was my first viewing of the film. This film is another ‘true story’ about an under-cover FBI agent with the false name of Donnie Brasco (Depp) who gets in with the mob, starting with a mentor named Lefty (Pacino). Lefty is a frustrated gangster who is often passed by for younger bucks, but he is also loyal as can be. He is a bit of an alcoholic, he’s not particularly bright, his son is a drug addict. But he really grows to care for Donnie, and a father-son relationship forms despite the fact that one of them is living a lie. The best parts of this film are Depp and Pacino going at it. They have a natural chemistry, and they power through even when the dialogue gets a little silly (all the talk about what a ‘wise guy’ is and what a ‘made man’ is compared to someone who is a ‘connected guy’ or a ‘skipper’ or a ‘boss’). To be clear on where I stand, I would probably hate this movie if it was not for Depp, Pacino, Michael Madsen (as fellow gangster Sonny), and Bruno Kirby (another gangster, Nicky). Most of the rest of this stuff is useless to me, particularly an overly dramatic and unconvincing thread about Donnie’s real life and his failing marriage with Maggie (Anne Heche). The problem is, that marriage is one of the main two or three plot lines of the film, and it absolutely does not work. I don’t blame either Depp or Heche, but this movie doesn’t get it right. So we have some snappy dialogue, along with some inane and cliché banter. We have mostly solid acting. We have a decent storyline. Wonderful art direction (this is a film which starts off in the 70s, but was made in 1997), some nice cinematography. Where does it fail? The direction, by hot-and-cold director Mike Newell is inconsistent. The film doesn’t have a natural flow, and the sum of all the wiseguy dialogue topples this movie. There is a late scene with Paul Giamatti and Tim Blake Nelson as FBI Techs who ask Donnie about what the phrase ‘forgetaboutit’ really means. In a vacuum, this is a funny scene about the nuances of a colloquial word. But after nearly two hours of the differences between ‘wiseguy’ and ‘made guy’ it all just becomes a little unnecessary. The music, too, is often silly and dated. It feels melodramatic at points, and it really serves as to undermine the acting at some key points of the movie. Sometimes a good scene can be turned bad by clichéd music. Again, I fully understand that this is not my genre. I’m open to the idea that this is brilliant and natural. For me, it feels artificial. Though based on a true story, it feels influenced by a hyper-real Tarantino-meets-Godfather sort of concept. And while this is one of Pacino’s great roles, nuanced and vulnerable, it is somewhat under-utilized in a less-than-stellar film. First time I’ve done this, but a positive and a negative bonus lead to a wash. The art direction in this really is wonderful. I appreciate the aesthetic of this film very much. But the music really fails this movie. ~ by johnlink00 on November 14, 2012. I went in to this so wanting to love it. And there are parts of it which absolutely do. Like I said, I know this is a loved movie. I guess it goes on that list of things which others love, and which don’t land with me. (300 is the ultimate example of that. I loathe that movie. I merely was not impressed with DONNIE BRASCO, but I loathe 300). Do we need to do a Face-Off on this one? Haha.